As a business owner, two of the most important factors in increasing sales and attracting customers are visibility and brand awareness. You can emblazon your company’s brand onto Door and window commercial awnings. For homeowners, one of the most appealing options available is a retractable awning. Custom retractable awnings come in various fabrics, colors, and patterns. Retractable awnings are an affordable option to enhance your outdoor living area and decks. If you want increase your home’s overall curb appeal, consider installing a home awning. Combining home improvement projects such as landscaping and new siding, with a new awning can transform a home’s exterior. 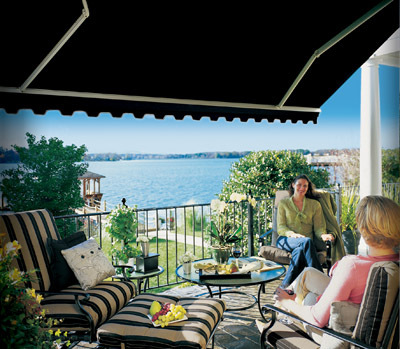 Our residential and commercial clients can shop for an awning that’s unique and customizable to their tastes. You can choose from hundreds of colors, patterns and high quality fabrics from the industry’s top manufacturers! Every smart business owner knows to put their name and street number on their awning – your logo, too, if local regulations allow for additional graphics. People won’t do business with you if they can’t find you. Another thing to bear in mind when you’re in the market for a new awning is that the variety of awnings, including mechanical or manual, are tailored to your home’s or building’s architectural design. For homeowners who like to entertain outdoors and spend time by the pool in the summer months, a retractable all-weather awning might be the best option. These also work beautifully for receptions and restaurants. When you look for the best ways to increase curb appeal, most home improvement projects sound like a lot of work. That’s not necessarily true about installing a new awning. With the proper motivation, equipment and instructions, your new retractable awning can be easily added to your property. At DIY Retractable Awnings, we offer step-by-step guides for installing a retractable awning. If you need further DIY help, we’ve teamed up with Mr. Handyman to offer installation services in most areas of the USA.